ENSENADA, Mexico—Following the third of four races in the 2016 SCORE World Desert Championship, 38 of the toughest racers in the world remain in the hunt to earn 2016 Red Kap SCORE Milestone Awards. In mid-September in Baja California, Mexico, Round 3 was held at the Rosarito Beach 20th SCORE Desert Challenge. 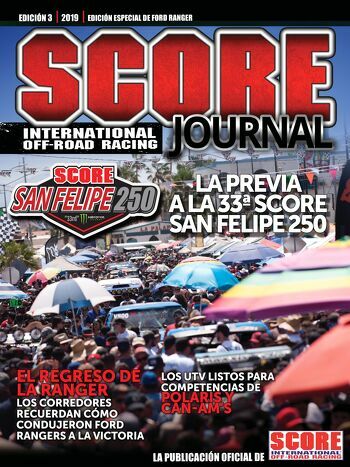 Racing for the first time in SCORE history in Rosarito Beach, it was run as four laps split over two sessions on a brutally rugged 37.1-mile course (128.4 total miles) that started and finished at the Los Manantiales area off of old Highway 1 south of central Rosarito. SCORE is presenting these prestigious awards to the world’s toughest desert racers for the 31st consecutive year. The Red Kap SCORE Milestone awards will be presented to the car, truck, UTV drivers and motorcycle, quad riders who finish every required mile in the 2016 SCORE World Desert Championship. Leading the way in the chase for 2016 Red Kap SCORE Milestone Awards are three superlative stallions in the featured SCORE Trophy Truck division, two in the unlimited Class 1, three in Trophy Truck Spec, five in Class 10, four in Pro UTV FI (Forced Injection), three in Class 1/2-1600, four in Class 40 (motorcycle riders over 40 years old) and four in Pro Moto Unlimited. As it has been every year for nearly four complete decades, the season finale of the four-race SCORE World Desert Championship will be next month’s iconic 49th annual SCORE Baja 1000. Nearly 250 entries, from 25 countries and 40 U.S. States are expected to compete in classes for cars, trucks, UTVs, motorcycles and quads in this year’s 49th annual SCORE Baja 1000. The race week festivities will cover Nov. 16-20, with the race and all side events starting and finishing in Ensenada, Baja California, Mexico. This year will mark the 42nd time the race has started and 24th time it will finish in Ensenada. Entry registration for the race is available online at RegisterHereForRace. The drawing for starting positions for all classes, except the featured SCORE Trophy Truck and Trophy Truck Spec will be held Thursday, Oct. 13. To be included in the drawing, entries must register online by 10 p.m. PT on Wednesday, Oct. 12. Entries received after the drawing will be given the next available starting position within their respective classes. Pre-running on the approximately 830-mile course opens on Saturday, Oct. 22 with the start to Ojos Negros only allowed on Wednesday and Thursday of race week (and only outbound practice). SCORE Trophy Truck, the marquee SCORE racing division for high-tech, 850-horsepower, unlimited production trucks and the Trophy Truck Spec class will have a special qualifying session for start positions on Tuesday, Nov. 1 on the Off-Road Track at Las Vegas Motor Speedway. The two SCORE racing classes will be featured that week in the massive SEMA SCORE Baja 1000 Experience at the SEMA Show at the Las Vegas Convention Center. The three SCORE Trophy Truck thoroughbreds who have galloped through every challenging race mile so far this season are: Billy Wilson, Corpus Christi, Texas, (No. 15 Bevly Wilson Motorsports Chevy Silverado), Carlos ‘Apdaly’ Lopez, Tecate, Mexico (No. 1 RPM Racing Chevy Rally Truck) and Gary Magness, Denver (No. 45 Mango Racing, Ford F-150). SCORE Trophy Truck is the sport’s marquee racing division for high-tech, 850 horsepower unlimited production trucks. Racers still in the hunt for the coveted awards from Class 1 for unlimited open-wheel desert race cars are Brad Wilson, Long Beach, Calif. (No. 153, Jimco-Chevy) and Jaime Huerta Jr, San Luis Rio Colorado, Mexico (No. 175, Racer-Chevy). With the most drivers still in the chase for these awards are five drivers from the super-competitive Class 10 for single or two-seat open wheel desert race cars with limited engines. Also in a tight battle for the season point champion in their class, the racers are Todd Winslow, Clovis, Calif. (No. 1081 Alumi Craft-Chevy), Rafael Navarro IV, Temecula, Calif. (No. 1009, Alumi Craft-Chevy), Sergio Salgado, Mexicali, Mexico (No. 1088 Jimco-Honda), Mike Lawrence, Sunset Beach, Calif. (No. 1058 LMS-Chevy) and Armando Boehme, Royce City, Texas (No. 1060 Jimco-Chevy). From award-winning documentary filmmaker Dana Brown, Dust2Glory will chronicle each of the four races in the 2016 SCORE World Desert Championship. Now, D2G, which began shooting at last year’s SCORE Baja 1000, and is continuing up close and personal coverage capturing the robust racers in their amazing adventures in Mexico’s majestic Baja California peninsula through all four spectacular 2016 races.